If you live in an old house, chances are you are very familiar with the phenomenon that if you set a ball down to rest on the floor, it will easily roll to some little sweet spot across the room. Some resting place where the settling and shifting of time has caused the floors to sag and give. And when floors sag, chances are you have a few doors that don't cooperate either. If you want them open, they want to swing closed, if you want them closed, they'll swing open. In a house with so much character as ours has, one piece of hardware is vital–the rock door stop. And it just so happens that if you follow our mowed trail out the back fence and through the field you'll find yourself at the perfect little stream crossing. The perfect little spot for gathering nice, heavy rocks to hold back doors. On this particular trip, I failed to remember that you can't rush stream play. We'd just returned home from running errands on a beautiful day and I was feeling stir crazy. If I was a completely responsible mother, I would have been sending all my children upstairs for stories and naps, but instead I decided to strap Elizabeth into the backpack, tell the girls to get their bathing suits on and grab a bucket. We were going rock collecting. Of course I told them we were on a time crunch. A small piece of information that didn't sink in. We're only going to take 20 minutes. Don't take off your shoes in the water. Just don't get your hair wet. Don't sit down there, you'll get the seat of your suit covered in sand and mud. You must carry your own rocks back to the house. All in all. A good outcome. I have a lovely tattoo of flowers on my bicep, which I'm thinking looks pretty tough. And my bathroom door no longer hits me on the way out. 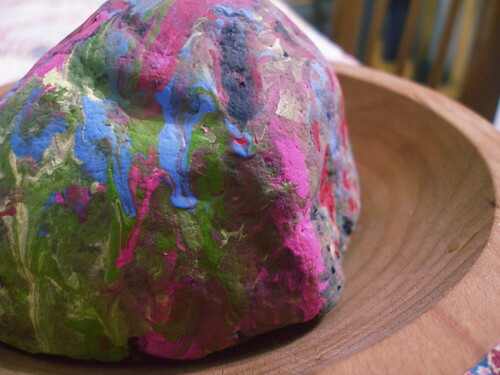 Pretty painted rocks would make a much better doorstop than my large book that got wet last week and now looks really gross..
It’s amazing how kids remind us to slow down, isn’t it? I think they’ve been my best teachers at keeping out of the suburban rat race where I live. I love the creek. We even found one I blogged about within a few minutes of our house, here in suburbia! Yours looks beautiful. I can’t believe you have such a gorgeous stream in walking distance! It puts our winter-only creek to shame! I was originally drawn to your blog because of its name beginning with Molly which is my daughters name. I have since been drawn to it because of the wonderful photographs and narratives. Thank you for inspiring me with your honesty that reads beautifully. Molly, I nominated you for a blog award! love your blog and want to visit you sometime. OMG! I wanna come live at your house. I wanna go . . . I wanna go . . . I wanna go too!!!! If there is water any where near me . . I HAVE TO GET IN IT!!! You are so fortunate. . . a gift from GOD! We kept losing out doorstops and finally resorted to industrial-non-chic kick-down doorstops on all of our bedroom doors to keep them from swinging shut on their own. How’s you’re 4-legged child doing? 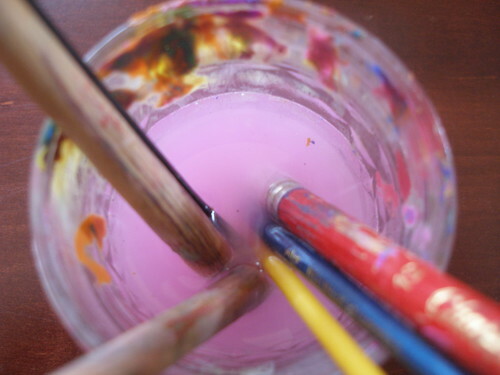 Not that you’d want to do this all again but… another cool idea is to heat the rocks up in the oven on a cookie sheet and then let the kids color them with old crayon stubs. They melt and its really fun! I just love old houses! One of my favorite ways to spend a summer afternoon is “rock hopping” aka playing in the stream. I don’t know how it got called that originally because no rock hopping is involved…but splashing in a creek is hard to beat! Ok, you are making me sick. Seriously, I’ve been dying to move to the country. I love watching all the fun adventures your girls go on. Thanks for sharing. what a wonderful story, molly. and the images just so so lovely – your girls are lucky to have you in their world, with such a love of the moment and ability to suspend “the plan” in order to stretch out those beautiful memories just a bit longer. so lovely. We’ve had a lot of fun with rocks this summer too only ours have been used for dice games! Great story. sometimes you just have to let it go….i try to remind myself of that. we moved from our country home to the city over the past month and i am missing my old, character filled home. thanks for reminding me of the good things. Next Next post: am I a modern mom?